So, don’t you hate those people who get all snobby about stock powders that come in cubes and cans and stuff? You know, the ones who make their own stock and simply can’t understand anyone who doesn’t? I’ve become one of them. Sorry. 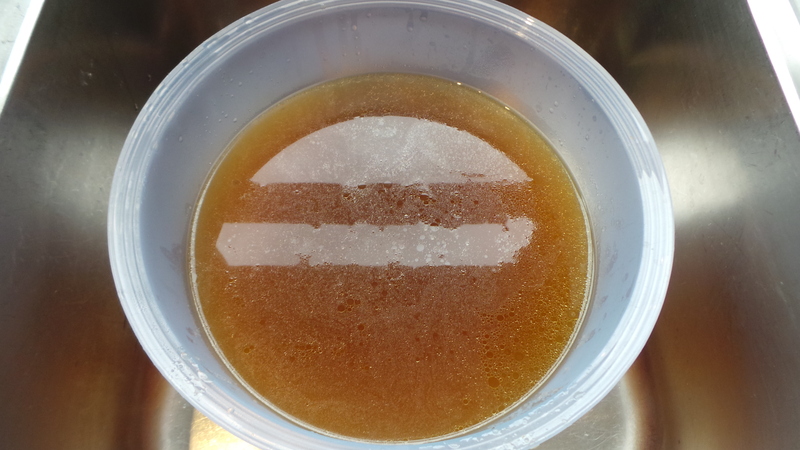 I used to be the person who would reach for the Massel or the Vegeta if stock was necessary, but since I moved at the start of the year I’ve been making my own actual liquid stock and it is soooooo much better than anything I’ve ever bought – even in one of those tetra pack doovers. 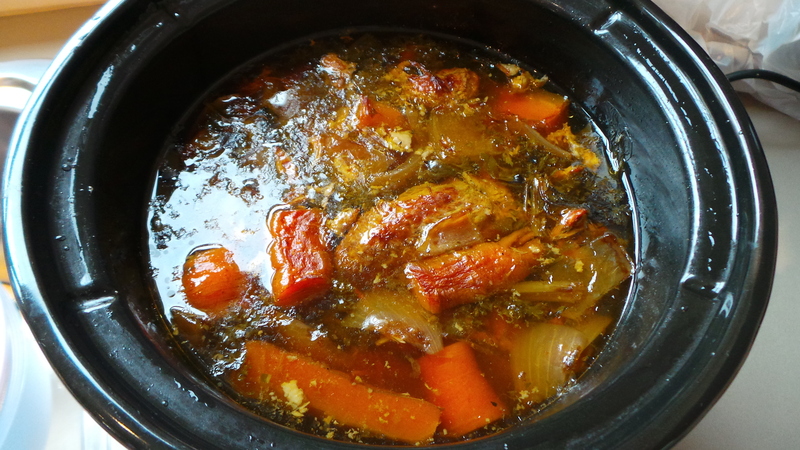 I make my chicken stock in the crock pot or slow cooker overnight. It’s terribly uncomplicated. Every now and then The Boy and I buy a BBQ Chook* from the local supermarket for one reason or another. 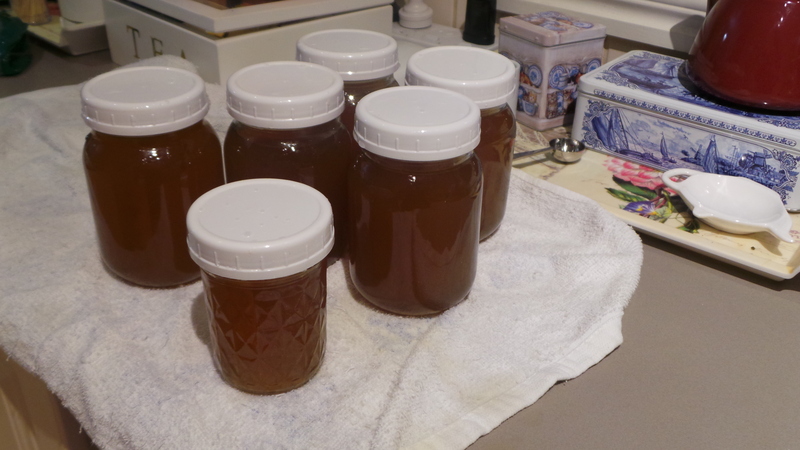 After we’ve picked as much of the flesh as we can off it, I use it for stock. Now, if the freezer is already well stocked with…um… stock, we simply freeze the carcass until we need to restock the … stock. Follow? Good. 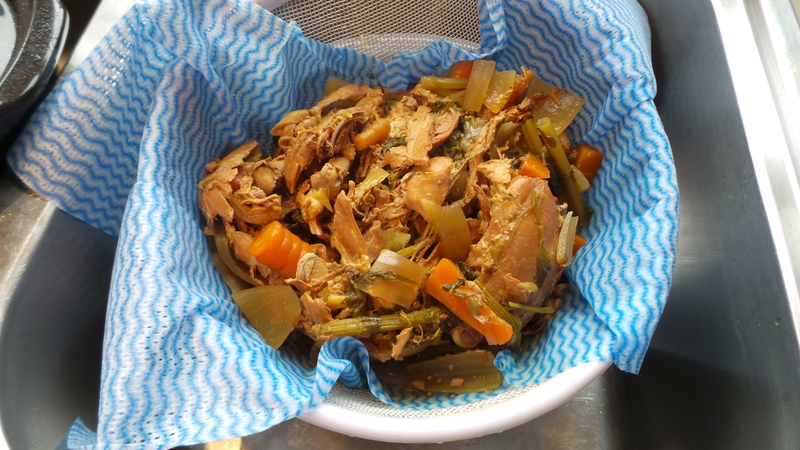 Pop your chicken carcass into a slow cooker or crock pot. You can do this with an uncooked chicken, but a cooked one will give you far more flavour. Make sure to remove any stuffing from the cavity and dispose of it. You don’t want that in your liquid. 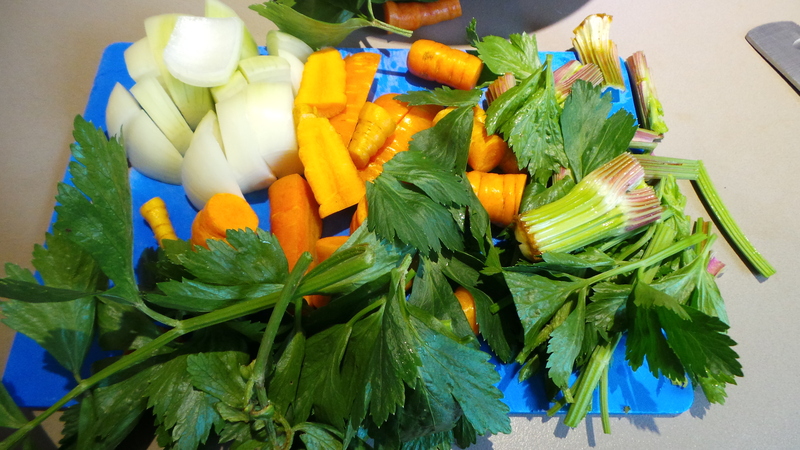 To the slow cooker add a roughly chopped onion, a couple of carrots and some celery. There is no need to add salt or any other seasonings. You want your stock to be as versatile as possible, add other flavours to the final dishes not here. It honestly doesn’t matter how your vegetables look either. They’re all going to be thrown away at the end of the process — after every skerrick of flavour has been cooked out of them. Basically, you just want to be able to fit them in the pot with the chicken. 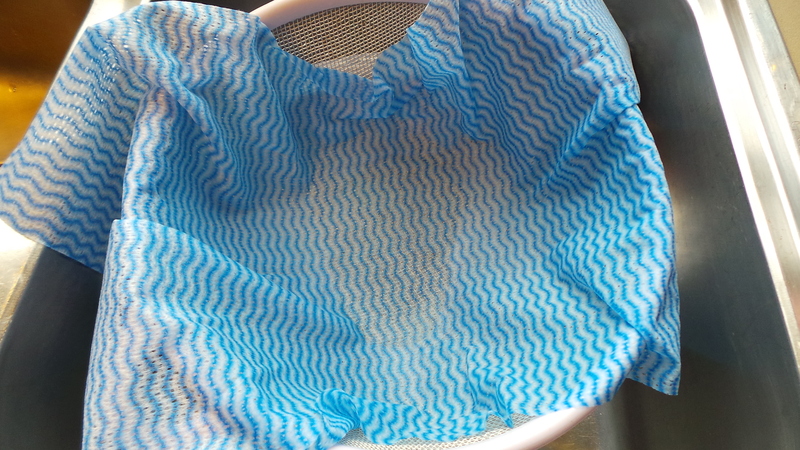 Cover the contents with water – you can boil the water first if you wish. And doesn’t that look terribly unattractive? Don’t worry, it’s not the finished product. Then upend the contents of your slow cooker into it. It will look horrendous. Walk away from the sink. Shower, dress, have a nice cup of something warm and caffeinated. Don’t worry about the fine layer of fat you can see in the sheen on the surface. 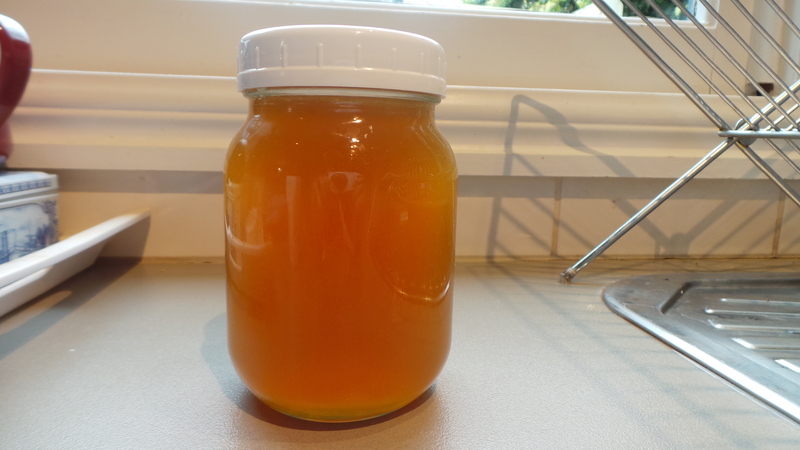 That is pure flavour and, when chilled, will give the stock a gelatinous texture. Now, all you need to do is bottle it. Place it in some sterilised mason jars and freeze it as I do. You could also place it into ziploc bags for freezing. Alternatively, you can put it in a large saucepan and boil it until it is so reduced that you can freeze it in ice-cube trays as an über concentrate that you add water to when defrosted. 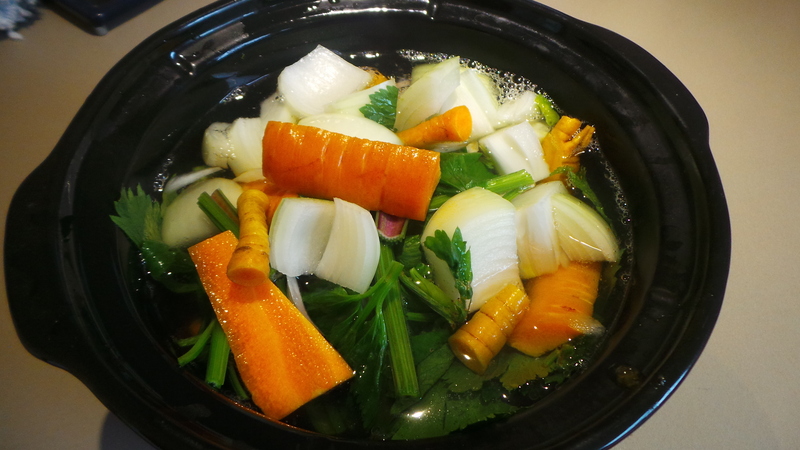 My 3 litre slow cooker made 2 ½ litres of stock. Isn’t it purdy? Give it a shot, you’ll love the results. I promise. It will also make you feel all chef-y and virtuous (for not throwing food away) at the same time. 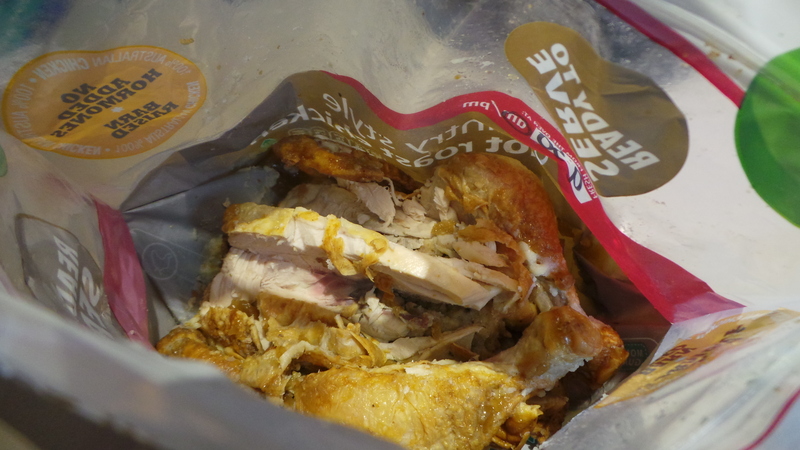 *Side note: Try going into an American supermarket and asking for a BBQ Chook. I dare you. If you happen to be an American reading this, it can be translated as ‘Rotisserie Chicken.” You’re welcome.